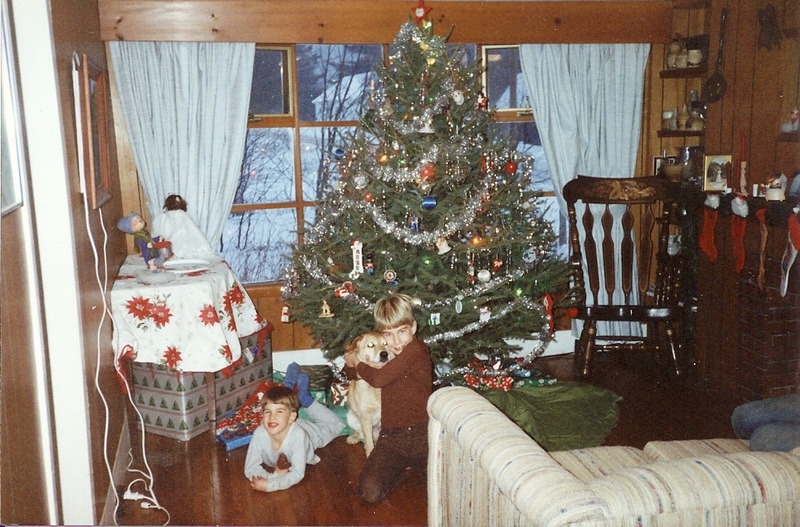 May I share this famous poem, along with a few family photos of a past Christmas or two? 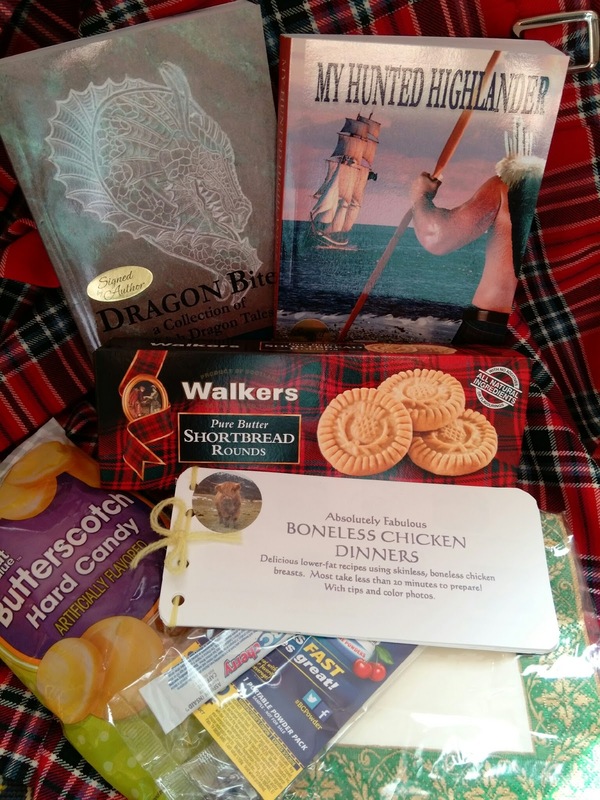 Win your choice of these Scottish prizes. Open to US and International Winners. 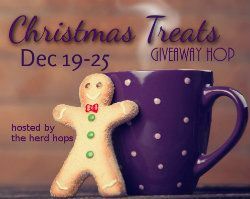 Don't forget to stop by each blog, also listed below, for a chance to win fabulous books and gifts for the holidays! Jenny raced into the hall without shutting the heavy oak door. Too weak to get up, Blair sipped the bitter brew and wondered how much time had passed. When a servant poked through the door, she smiled. She didn’t want to be alone, not with all the craziness going on around her, and her missing son. “Can I help ye dress, my lady?” Her head was down, and wrapped in a triangle of white linen. One gold braid hung down her back. She shut the door behind her, and strolled to a large armoire. “What? They left without me?” Blair hopped to the floor, wobbled, and nearly fell to her knees. No purchase necessary, open to Continental USA residents. 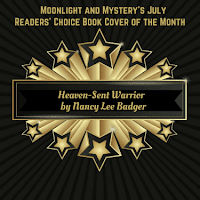 International Readers will receive ebooks from Nancy's backlist. 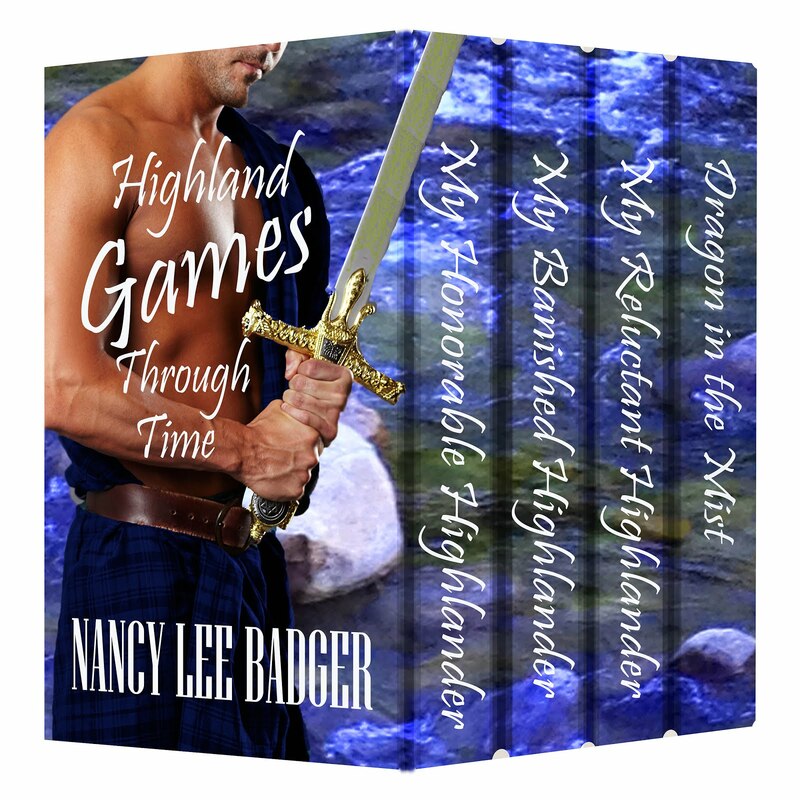 After writing several novellas that wove a tale around Scottish dragons,I wanted to use my love of modern Scottish Highland Games to weave tales using time travel and Highlanders. Since my family volunteers annually at the New Hampshire Highland Games, I filled notebook after notebook with my interpretation of the sights, smells, sounds, and history of the games. Research added to my list of possible story ideas. 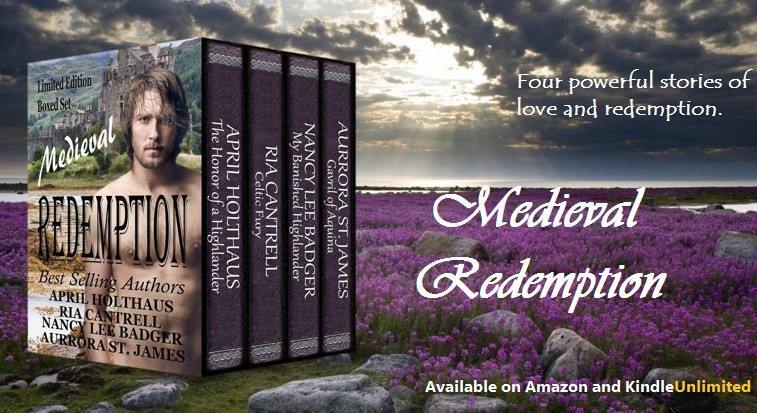 I have since completed six books set in both the fictional present-day New England Highland Games and 16th century Scotland. What do modern games have to do with a story of ancient Highlanders? Plenty, especially since I match heroines and heroes from different times. Besides the costumes and weaponry people wear to these festivals, there are sports, food, craft displays, music, and vendors beneath tents selling everything under the sun. The aroma of meat pies mingles with the tang of fresh-squeezed lemonade. Sheep, herded by a border collie, run near tent-covered platforms where pretty girls dance a Highland fling. Bagpipers march while craftspeople spin wool or tell tales to kids, giving me dozens of ideas, which I carefully noted. 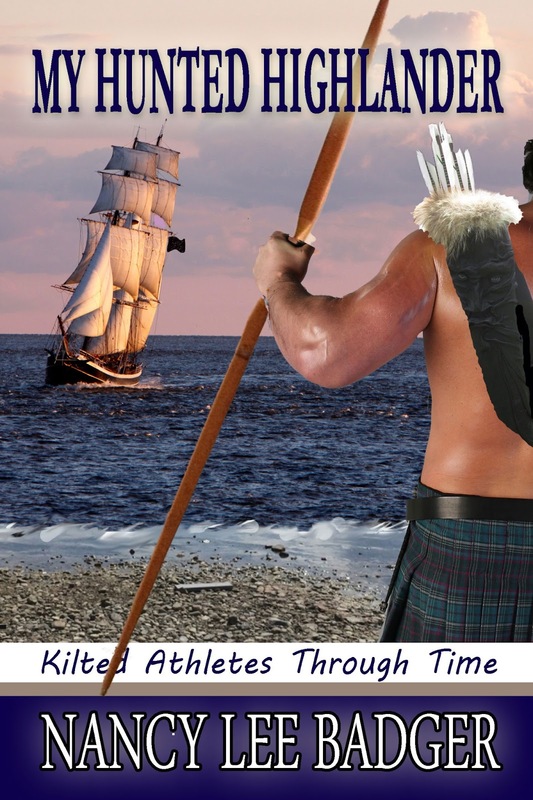 The modern games are so much more than an athletic competition yet watching burly, kilt-wearing men tossing a tree called a ‘caber’ end-over-end is a favorite sight. Historically, the games were a way to hone skills. Coming together once or twice a year gave a community a sense of camaraderie during a time of upheaval in Scotland. Skill, stamina, and determination easily kept young Highlanders ready for war or any threat to their livestock…and women. Foot ra ces kept messengers ready should they need to spread the word of a battle. Even the simple tug-o-war kept a warrior’s body ready to answer the call to war. When my fascination with pirates entered my head, I created a female pirate plying the North Sea in a ship I named The Black Thistle. 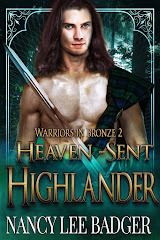 That story, released this year, is titled My Hunted Highlander. Niall Sinclair wakes bound to the mast of a pirate ship. Hiding his identity, his reaction to their female captain makes him nearly forget his need to escape. 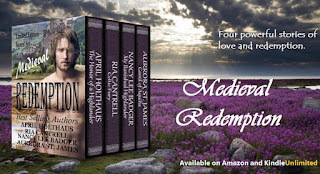 Kidnapped from modern day New Hampshire, and now at the helm of a pirate ship in 1603 Scotland, Blair MacIan sees Niall as a chance to escape to her world. Nancy- Let's start off with something intimate! Please share 3 things readers might not know about you. 1) I never realized just how much I was going to adore retirement. I have had a job since I was twelve years old, so this is new territory and the best yet. 2) I was born with EB (Epidermolysis Bullosa) fortunately the mild kind but please check out the Butterfly Fund for a wonderful cause helping those children who had a much worse case than my sister and I had. 3) Since my retirement I get up at 6 a.m. just like "normal" and swim for 30 minutes – much better for me than the stress eating I was doing on the job. When Symone finds herself unexpectedly in custody of her confused and frightened four-year-old niece for Christmas she knows she has to make it work. 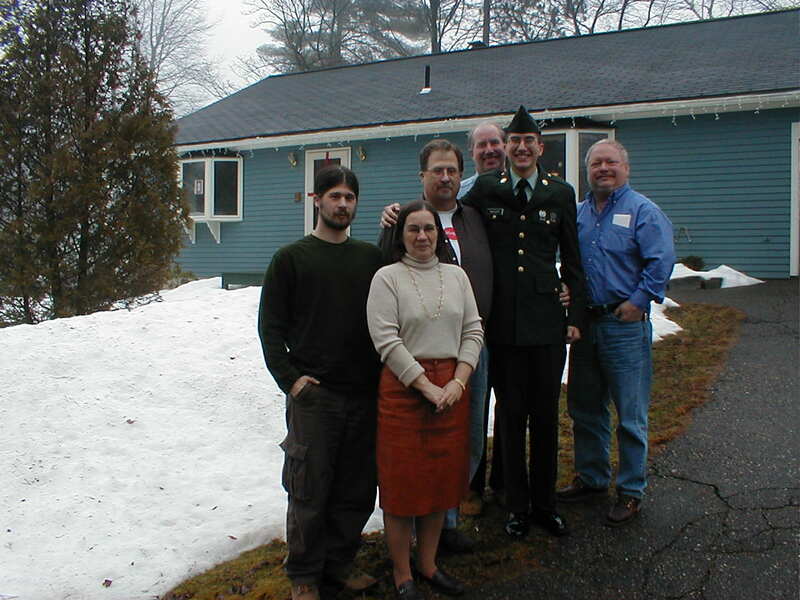 Symone's sister had to get to her husband, injured in Afghanistan and in critical condition. Rachel is left in limbo with only a few days 'til Santa comes. It helps when Blake, a friend of her brother-in-law, shows up to try to make it a merry Christmas for Rachel but Symone doesn't know the man or the history he's hiding. And she's not interested in another holiday with the wrong guy. Can they save Christmas for the child they both love? 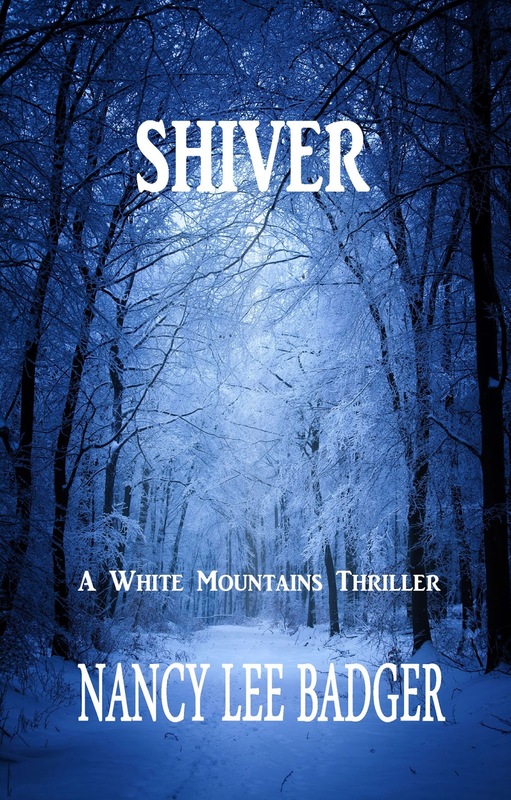 Without warning Rachel darted past Symone and flung herself into the arms of the large man. "Not a rag doll, Rachel!" He hugged the little girl and then looked into her face. "I can never remember that. Are you sure your name's not Rags? With that hair?" Symone relaxed slightly. The two obviously knew each other. Rachel had the same red hair she and Alicia had, if a little lighter at her age. "Aunt Symone, this is my Uncle Blake." Symone blinked at that. Jerry was an only child. He shifted the child in his arms and held out his hand. "Honorary uncle. I'm Blake Connelly, a friend of Jerry's." She saw the tightness return to his eyes at the mention of Jerry's name, but he said nothing in front of Rachel. "Please, come in." She stepped back and he followed her, giving her a chance to close the door and keep the cold outside. "They said Daddy got hurt. Were you there?" Rachel asked him. "No, Rags. I'm sorry I wasn't. But I'm sure he'll be fine." "Momma went to get him, so she won't be here for Christmas." "I thought about that and that's why I came to check on you." "You'll stay here?" The little girl's arms went around his neck. "You can have your old room." Symone blinked at that and froze. Wait a minute, who was this guy? "I probably shouldn't stay here. You and your Aunt Symone have plans I'm sure." "No we don't. Please Aunt Symone. He can stay can't he? He always does. You two could share the room. It's a big bed." Symone just blinked again, trying to regain her equilibrium. "I can get a room close by—"
"Do you usually stay here when you visit?" Symone managed to ask. "Yes, but this is different." 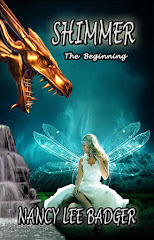 Symone looked into the pleading eyes of the little girl nestled comfortably in his muscular arms. The holiday was already so screwed up. "I can move into Alicia and Jerry's room." "Yes!" Rachel squealed and Symone winced slightly. Blake seemed to take it in stride. Symone straightened her back. "Yes. It'll be fine." He nodded, the gesture saying more to her than he could in front of the child and Symone smiled, relaxing a little more. "I was coming to ask Rachel what she wanted me to fix for dinner." "Could we have grilled cheese sandwiches and tomato soup?" Rachel responded immediately. "That would be perfect. Suit you, Blake?" Symone asked. "That's exactly what I was going to ask for." He let the little girl down and Rachel scurried off to find something she wanted to show him. As soon as Rachel was out of the room, Blake spoke. "I don't have to stay here. I realize I'm a stranger." "I know. But she's already so upset. I think it would be good for her if you're here." "Thanks. I'll be on my best behavior." She chuckled as Rachel careened back into the room carrying the tattered Christmas catalog to show Blake what she had asked Santa for this year. "I'll go get started on dinner." "You're already giving it." Symone smiled and headed for the kitchen, keeping an ear out for the conversation going on in the great room. She still didn't know for sure who tall, dark and gorgeous was, but Rachel obviously knew him well. Nancy- How can my readers buy your book? 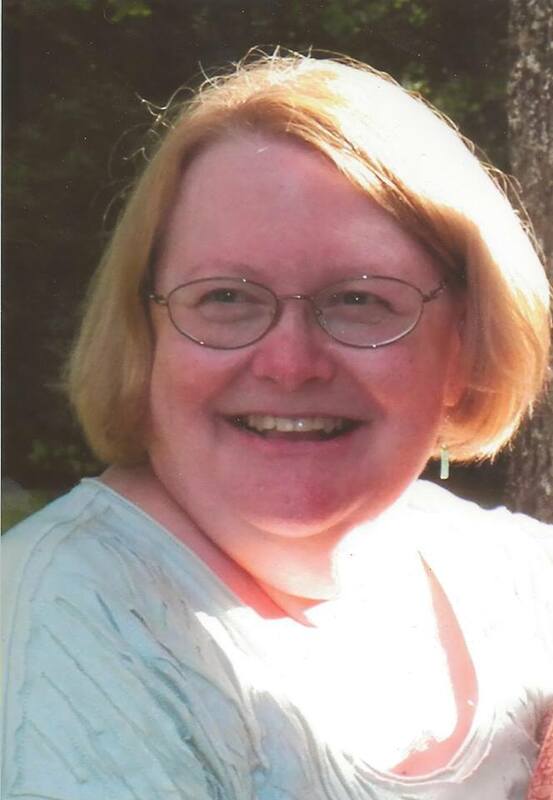 Donna- I try to take turns and since this is a small town romance, I need to turn back to Sci Fi/Paranormal. 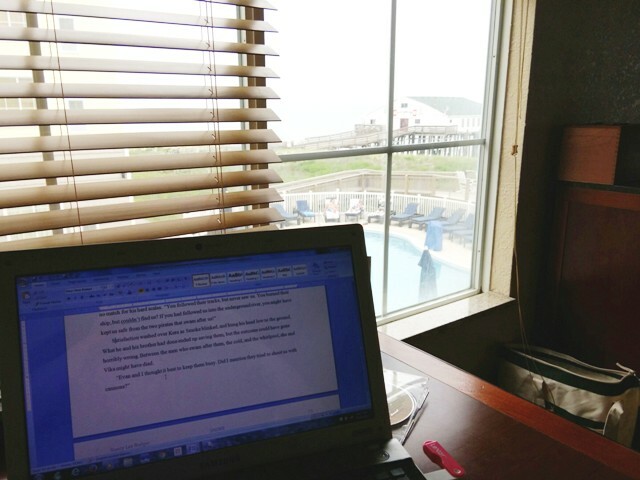 I have contracted a time travel book with Soul Mate Publishing, so I've got to get into the deep editing of that. Women strong enough for love. 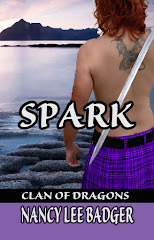 I write science fiction, paranormal and small town romance eBooks about women coming into their strength and having the courage to find and accept love. Now that I have retired from going into an office every day, I created my own at home and write full time. Talk about living the dream! Since I learned to read I’ve wanted to write. The possibilities of science fiction have always drawn me and I’ve read them all, there just needed to be a little more romance in them. I finally got up the courage to write them myself and I’m delighted that I’m able to share these stories with you. in March 2012. Since then I've been fortunate enough to release 13 more works, including my first self-published novel – Alien Embrace. Please stop by my author page at www.steelestories.com for excerpts of my books. 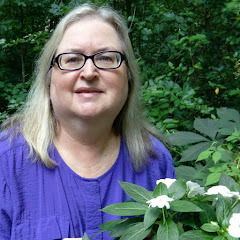 I’m a member of Romance Writers of America, the Fantasy, Futuristic & Paranormal Chapter of RWA and the Heart of Carolina Romance Writers. ***And she has just released another book! 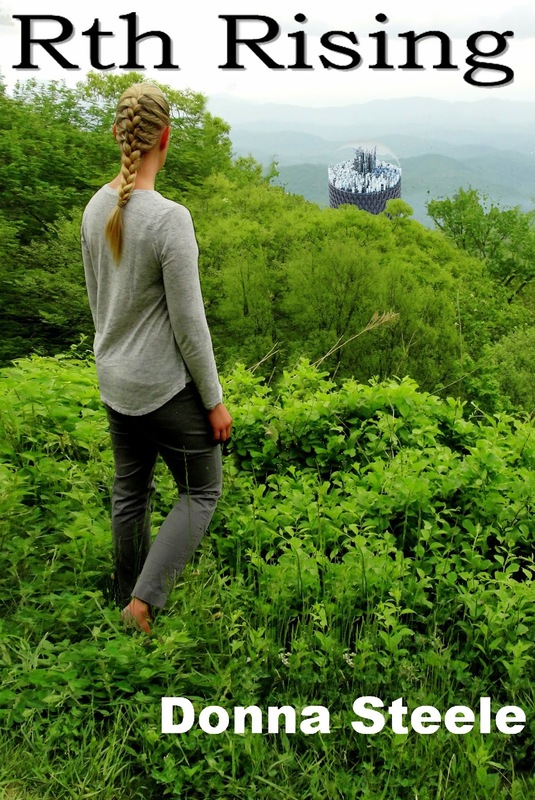 Rth Rising, a 'new kind of sci-fi romance'. 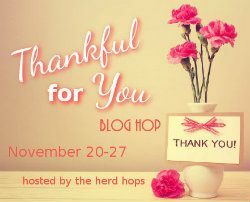 Giving thanks on the 4th Thursday of the month is an American holiday, but this time period is also a way for me to give extra special thanks to all my readers. You are what keeps me wanting to write the next novel, and the next. Without book sales, and reviews, we cannot succeed. 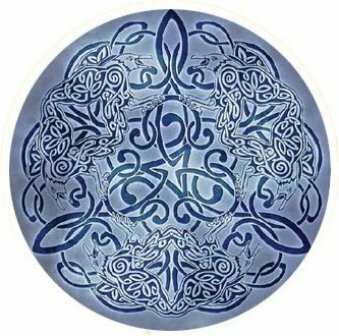 During this super sale, I will be GIVING AWAY a gorgeous ice blue Celtic Raven Decal to one lucky reader. Enter below! “So, talk,” Blair said. She wrenched her wrist from Niall’s grasp, and crossed her arms over her chest. The green vest swelled above her arms, as if offering her breasts to him. He doubted she realized it. Her top teeth bit into her bottom lip. She was eager for an argument, but all he wanted was her breath mingled with his. Blair’s eyes widened, and she stepped back. She was pinned against the stone building, in a perfectly private corner. He swooped, pressing his hands flat against the wall, so as not to touch her, which would be his undoing. He feathered his lips over her mouth, then stepped closer, until his lips caressed her mouth, then kissed the soft flesh beneath her right ear. “I will no’ argue the point. I am no’ like him. I swear.” He kissed her again, then cupped her face in his hands. Her skin was smooth, and far lighter than his weathered skin. Pulling back to see her reaction, his eyes narrowed. When he felt her body stiffen, he remembered that a man she called husband had treated her ill.
Did you enjoy that? 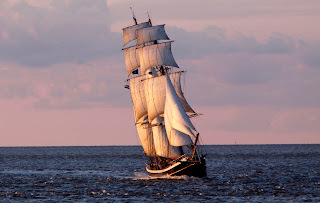 Wait until you read about my hero's ordeal aboard the pirate ship, and the longbow competition. Lots going on in ALL my books. wow! It is Finally Here! 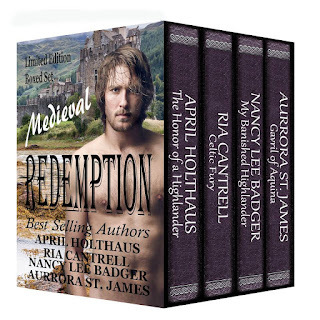 MEDIEVAL REDEMPTION! Medieval Redemption is out and actually released late last night, on my birthday! 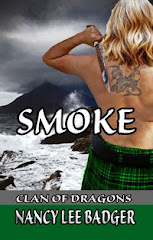 FREE to Kindle Unlimited subscribers!